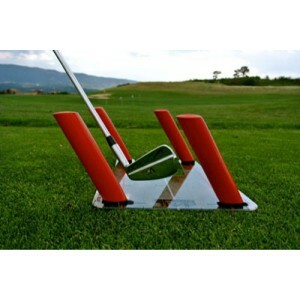 This unique device help you developed two things, hit it longer and hit it straighter! Improve your impact position and your swing plane through impact. 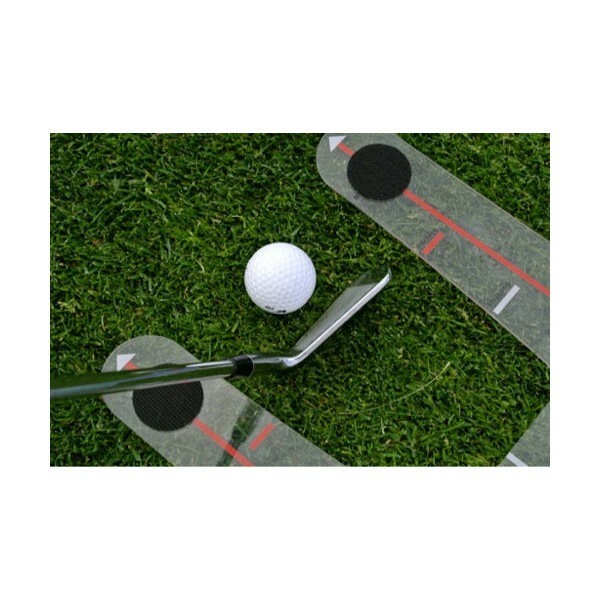 This unique device help you developed two things, hit it longer and hit it straighter! This is accomplished by doing 2 things: Hit and catch the ball and then the turf. 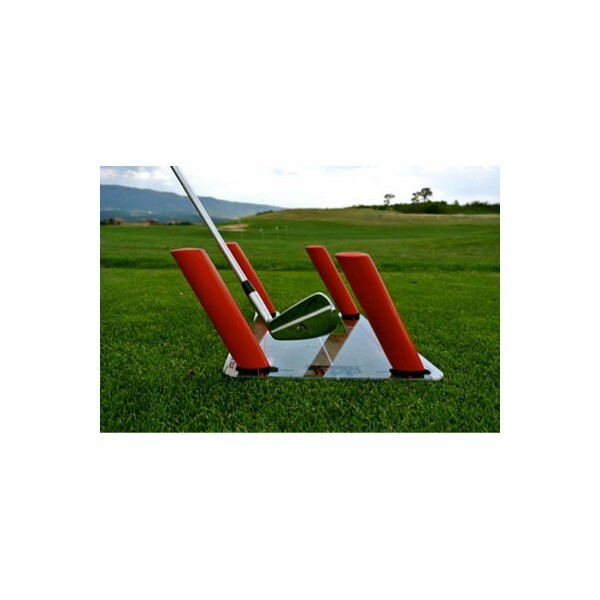 Create a nice crisp divot, hit it solid with great trajectory and phenomenal spin. The Polycarbonate base tells you instantly if you are scooping the ball or hitting it fat. Swing On-Plane- When you learn to swing the club between the plane rods, your club will be on plane and on path. Great for eliminating a slice or hook and ultimately leaded to straighter longer shots. 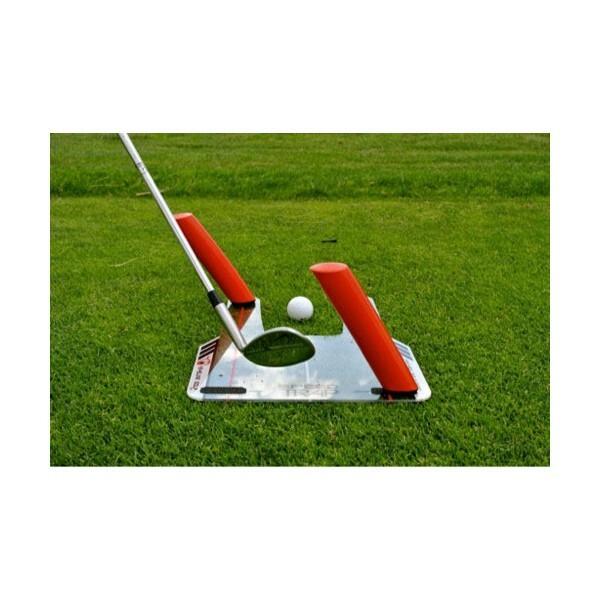 Also, an incredible tool for chip and pitch shots. Step 1: Set a ball in front of the red line. Hit full shots with middle irons. To begin, tee up the ball just above the ground. Step 2: As you improve, move the ball closer to the white line. The steeper the swing path, the closer the ball gets to the base. Set 2 rods on the front of the base: If they are too narrow, turn them toward the target or away from the ball until you can safely hit the ball. Set 2 rods on the back of the base: Start with the rods as wide as possible. Move them slightly together as you improve. Set 4 rods on the corners of the base: Start with the rods as wide as possible. Move them slightly together as you improve. Begin without a ball, then put it in play. To take away the “over the top” move: Put a rod on the back top corner, and front inside corner. To prevent coming too much from inside the line: Put a rod on the back bottom corner, and front outside corner.